Despite the popular misconception that most seniors are eager to downsize from their family home into that space-efficient, low maintenance condo, studies show that once someone hits 55-ish, they prefer to stay put. Lately, “aging in place” is the buzz phrase in renovations and remodeling. And since many people retire to the Cape to enjoy the beautiful beaches and time with their family and friends, we suspect Cape Codders are especially reluctant to leave their beloved Cape escapes. So as the country’s population continues to age and our life spans increase, more people are facing tough decisions about how to adapt our homes to best accommodate our physical challenges. 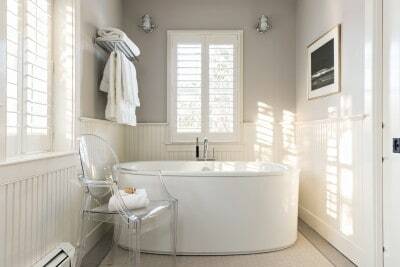 What should we do with the tub? Clients frequently worry that replacing an increasingly unsafe step-in bathtub with a custom walk-in shower will hurt the home’s eventual resale value. Our first question is always: “What is the safest, most practical, and most stress-free solution for your current needs?” While concerns about your home’s future resale value are understandable, they pale in comparison to the sobering statistics that each year, 2.5 million seniors are treated in emergency rooms for fall-related injuries. If you have two tubs in your home, you’ll surely want to keep the second one for a convenient place to hose down the dog or bathe a visiting grandchild. If you’ve only got one bathroom, it’s true that removing the tub might make your home unappealing to a family with small children somewhere down the line. However, on Cape Cod, where a home is more inclined to draw empty nesters, new retirees, or elderly buyers, the bathroom modifications you make now might just seal the deal for a new buyer. Basing your bathroom remodeling decision on resale value is important if you don’t plan to stay in your home for much longer. But if you intend to live there as long as your health allows, concerns about what the next owner may want should take the back seat to what you will need. 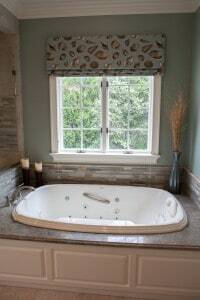 For all you know, the buyers may decide to remodel the bathroom themselves, no matter what you do to it. When it comes to upgrading the master bathroom, you’ve got an abundance of aging-in-place modification options that also make your home very desirable to people of all ages. Don’t worry — your new bathroom won’t look institutional. Numerous sleek, contemporary design options offer “visitability,” a term that building industry pros use, referring to a design that’s welcoming to people of all ages and abilities. A walk-in, curbless shower creates a spacious and safe bathing solution for someone using crutches, a cane, a walker, or a wheelchair (roll-in shower). If you’re concerned about wheelchair accessibility, the glass door should be a minimum of 36 inches wide, but you don’t even need doors on your shower. You can opt for a wide-open design with a centered drain and a subtle slope. It’s easy to blend functionality and safety with striking design elements, transforming your shower into one of your home’s most inviting areas. By choosing slip-resistant, textured tile for your shower’s floor and walls, you gain a safe surface that offers good grip with an upscale appearance. You can be ultra-creative with your built-in shower seat designs: matching tile benches, a fold-down teak wood chair, or even a movable seat that you can adjust or remove to maximize shower space. A moveable, handheld showerhead with an arthritis-friendly ergonomic grip offers a customizable, comfortable solution. And if the word “grab bar” makes you shudder, fear not! Today’s modern selections are not your grandmother’s grab bars. It’s easy to match these aesthetically pleasing safety essentials with your towel racks, and some grab bars double as attractive shelves to hold your soaps and shampoo bottles. 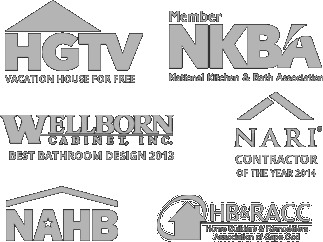 As with any improvements you make to your home, it’s essential that you work with experienced and reputable companies who truly do have your best aging-in-place and bathroom remodel interests at heart. 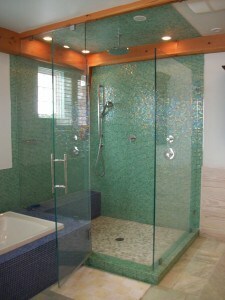 To check out photos of our own shower and tub renovations, just click here!